I just recently discovered my youngest daughter is afraid of someone in an Easter Bunny costume. This is a new development for us although Santa and other characters are totally cool (she says it's the eyes haha). If your kids aren't scared and you want to grab a picture before Easter, here are 5 ways you can get one! You can also find sighting of the Easter Bunny at the various events going on this weekend and throughout Easter. Find all the events coming up at Corpus Christi Fun for Kids Easter Fun 2016. These are the classic photos. Paul M. Bunny even has his sweetheart during the weekends. Easter photos during mall hours. Schedule a time online. 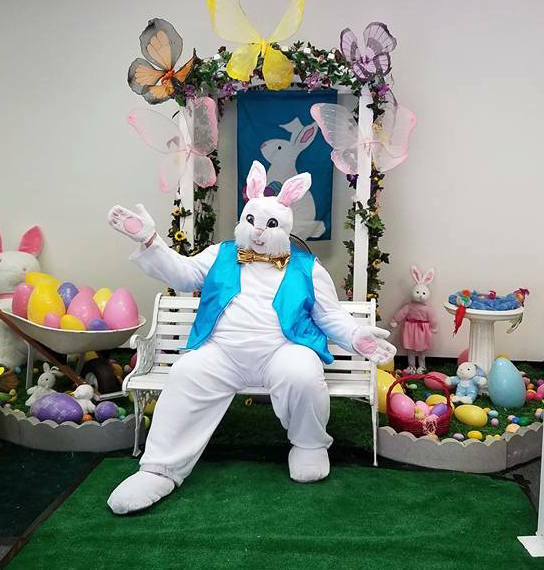 Come in for a buffet and fun, grab a picture with the Easter Bunny. Every week until Easter. If you don't mind doing it outdoors, they have a nice little setup. For kids that are scared of the Easter Bunny (costume) there will also be a live bunny for pictures. If you haven't been to Sunrise Mall for a while, here's a reason to do it. 5858 S Padre Island Dr.
5. Have the Easter Bunny visit your house! This bunny visits your house and you can use your own camera! Compiling information is hard work, please link back to this site if using this information on your events calendar. Know of another bunny or want to work with Corpus Christi Fun for Kids to be a featured event, let us know.